Business leaders know that establishing a solid customer experience (CX) foundation is essential. They may understand the core elements of a CX program—collecting and analyzing customer feedback—and feel successful after getting these baseline practices in place. However, CX industry experts have a different view. These analysts know that the most advanced CX innovators infuse customer-centric practices into everything they do. And industry watchers know that companies aiming to be CX leaders should follow the lead of noted CX trailblazers. How can companies move from laying the groundwork to a standout CX program? 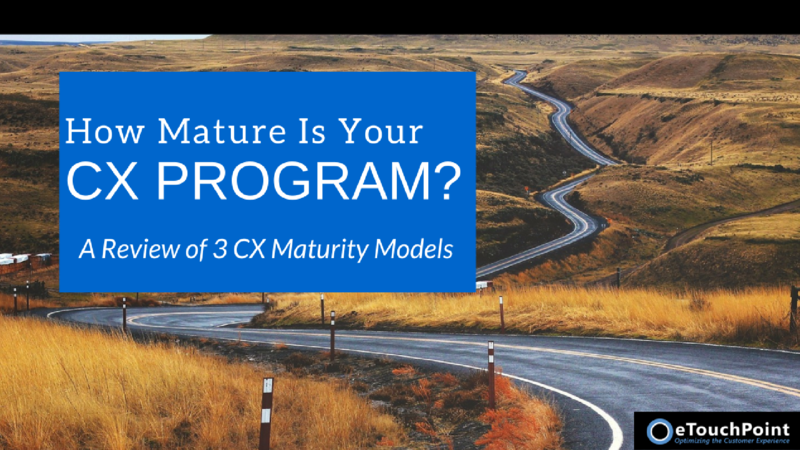 While each model is slightly different, they all provide a good framework to gauge the maturity of your CX program. And all provide guidance to help you progress your CX practices and operations to the next level. A 20-year business cycle in which the most successful enterprises will reinvent themselves to systematically understand and serve increasingly powerful customers. In the first stage of Forrester’s model, Repair, companies have identified that there are issues with the customer experiences they deliver. They have adopted basic practices to identify, measure, and address some of these issues. Companies in the second stage, Elevate, strive to deliver consistent, quality customer experiences across all customer interaction. They consistently measure customer interactions and share this information with frontline employees. By stage three, Optimize, companies have adopted a clear CX vision, along with more advanced CX tools and practices throughout their enterprise. At the final stage, Differentiate, companies have made CX a core tenant of their business. They have instituted practices to incorporate customer feedback into decision-making so that they can continuously align CX practices with authentic customer needs. The good and bad news for today’s CX practitioners: less than one in five companies are delivering good to great CX, although 84% aspire to be CX leaders. Cross-industry research by Gartner Group has affirmed that nearly 90% of enterprises expect to compete on customer experience—yet very few firms have attained the highest levels of CX maturity. The firm’s five-stage maturity CX model provides a path for companies to follow. At the first stage, Initial, companies have not yet articulated a clear CX strategy and typically house customer information and interaction data in disparate systems. By stage 2, Developing, companies have understood the need for a CX strategy and documented current CX practices throughout the business. One feature of stage 3, Defined, is that CX has an executive champion and key stakeholders backing the program. The company will have created a clear CX strategy and set medium and long-term goals. At stage 4, Managed, the company has clearly defined CX practices and provides regular training to ensure employees work in concert with CX objectives. Companies at the highest stage, Optimized, have fully embraced CX. These firms have technology in place to capture all relevant customer insight and have engaged their teams in providing customer-centric interactions. Just 1% of companies have reached the pinnacle of Gartner’s model, with 4% at the next highest level. That means that 95% of companies are still progressing through the three lower levels of CX maturity. A respected CX-centric think tank, the Temkin Group, has created a six-stage maturity model based on their work across multiple industries. At the first stage, Ignore, companies do not view CX as a fundamental differentiator and have no organized focus on CX. By the second stage, Explore, companies have begun to consider the value of CX and formed internal groups to assess ways to improve customer experiences. As companies evolve their CX practices, they progress to the Mobilize stage—and appoint an executive to oversee CX efforts and governance. At the Operationalize stage, the company proactively uses customer insight to realign operational processes. The next stage, Align, includes enterprises with widespread CX adoption and standardized CX measurement practices. At the final stage, Embed, CX is a core part of doing business and a critical factor in strategic decision-making. CX is a part of the company’s purpose and culture—and exceptional customer experiences are the norm. 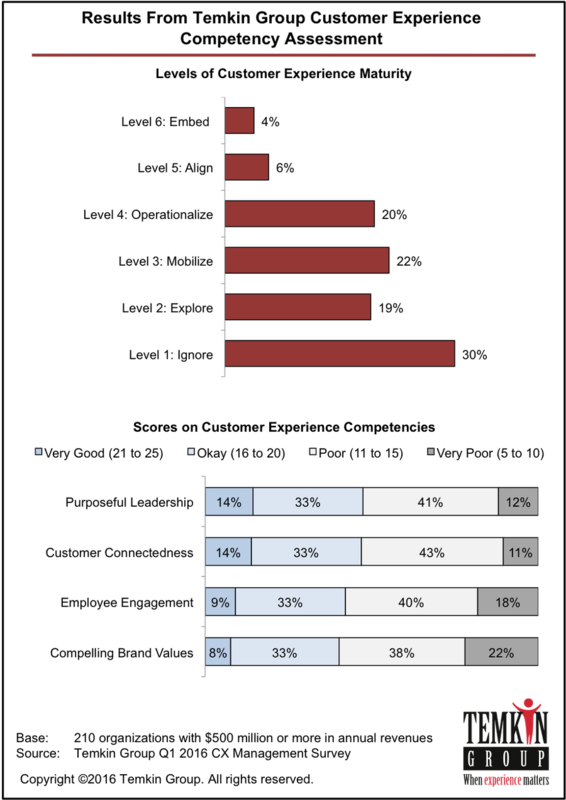 However, just 10% of companies have reached Temkin’s final two stages of CX maturity—with 70% at the lowest three levels. Where Does Your CX Program Stand? You may perceive that your company has a long way to go to achieve the heights of CX excellence. If so, you are not alone. 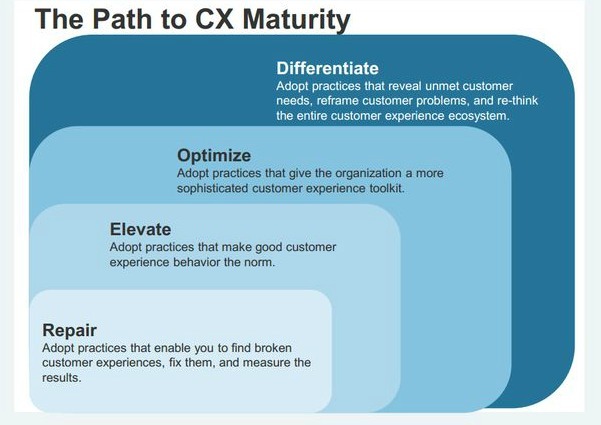 Although each company and each industry has unique CX challenges, CX maturity models offer a broad perspective on how to make progress. In every model, companies move from fragmented initial CX initiatives to crosscutting programs that touch every corner of the business. While evolving your CX program can seem painstaking, CX practitioners should not lose sight of the importance of their work. As Forrester, Gartner, and Temkin have validated far more companies aim to deliver high-quality CX than have achieved the highest levels of CX maturity. 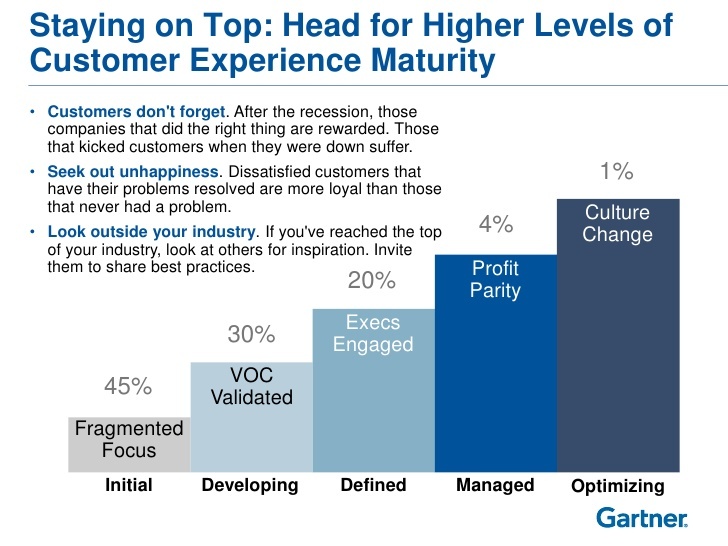 This gap between aspiration and reality is an opportunity for CX professionals. Those who are willing to do the hard work to advance their company’s CX practices can become the next wave of CX leaders and visionaries. They can guide the programs of visionary companies that distinguish themselves based on the experiences they deliver.